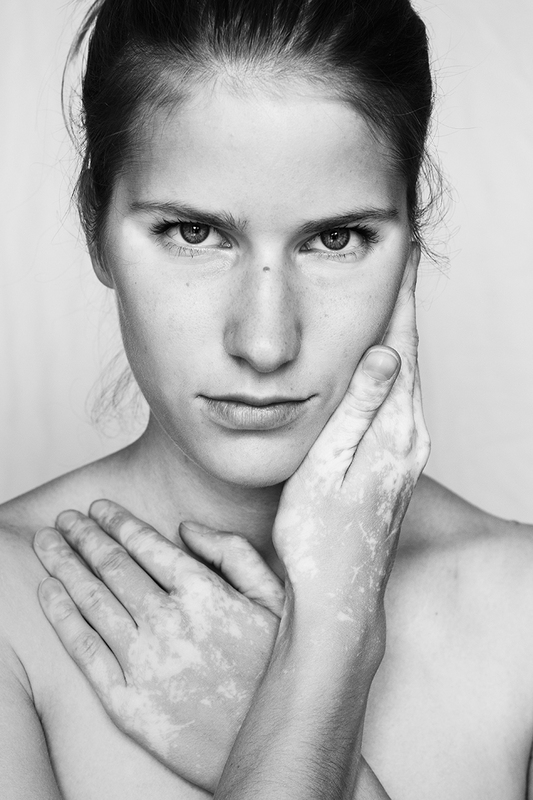 Julia Kaczorowska, a photography student at University of Warsaw, on history of white patterns, passion for photography and international meetings of the big Vitiligo Family. 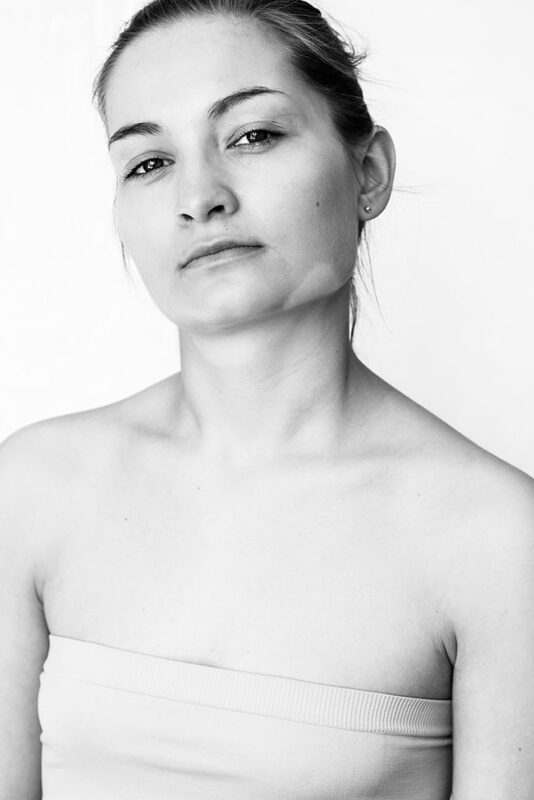 She has completed many documentary and advertising projects as a part of the NEBA collective. She’s addicted to travelling and trekking in mountains. I took my time getting around to do this interview with you. Since the moment I left the exhibition I knew it would eventually happen. Yet I had a mess in my head. I’m a photographer myself, constantly searching for inspiration, and I know how hard it is to find a good theme for exhibition. I’ve read some of your interviews and I didn’t want this one to be only about your works. I wanted it to be a talk about perception of your body. So, do you like your body? I mean how you feel about it now. It’s a tough question, because my attitude towards my body depends on many factors. It depends on my mood, the weather, or how tired I feel…Sometimes I stand in front of the mirror and feel really satisfied with my appearance, whereas other times, on the contrary, no matter how much I try, I feel terrible and would rather not leave my apartment. I guess this is the case with most women, though. But if I think on it for a moment, then yes – I’d say I like my body. I’d change this or that (and I don’t mean patches! ), but nobody’s perfect. I didn’t always had this confidence, I’ve been only learning it now. My boyfriend has had a lot to do with this, as well as trainings in the Otwarte Serca Zaciśnięte Pięści group that I’ve been attending for the past few months. Do you remember the moment you noticed discolorations on your skin? How did you felt then? I don’t remember. 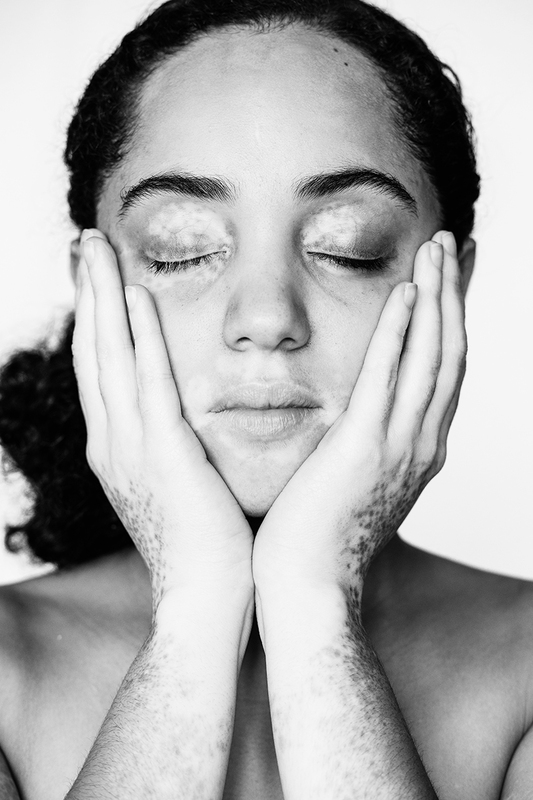 I was four when vitiligo appeared, but I feel like it’s has been with me all my life. As a little kid I didn’t think about my disease at all, I never had any kind of negative experiences because of it. It was at the end of the primary school and in the secondary school that I started to concern myself about it. These days we still shy away from talking about illnesses. We think that this topic doesn’t concern us. Maybe it doesn’t, but sometimes affects us personally. Even though vitiligo is not a cancer, when it afflicts such a young girl like you, I suppose it doesn’t make it easy to blend in with peers? As I mentioned, it was during the adolescence that I became “affected” by it. I tried to cover my legs, especially when on the beach. I have never had any negative peer experiences, though. In winter, my patches are barely visible at first glance, but in summer, as I have a rather dark complexion and get a deep tan, there is a clear contrast, so the patches are easily noticeable. Sometimes I get the questions, like “What happened?” or “Did you burn yourself?”, but it happens so rarely that, to be honest, I soon started to “forget” that I have those patches. We can see several of your works on your exhibition and now also in the Internet. I think it’s a good thing, of course, because you can focus only on what is here and now. On what is important. But still, I’m very interested in how many places did you have to visit to meet with the people that opened up to you? At the beginning of the academic year 2014/2015, when I decided to carry out a project on vitiligo, I started searching the Internet for volunteers. Eventually I decided to create an event on Facebook and share it on some groups for people with vitiligo. It was much harder to find volunteers in Poland than abroad; while there are many international groups, like Vitiligo Pride, where people with vitiligo share their experiences, post pictures, etc., in Poland it is not so common. I think that people in the West don’t treat their patches like something they need to fight with, but more like something worth boasting about (however strange that may sound). In Poland, it is still a topic that is rarely discussed and the forums are used mainly to talk about methods of treatment. In spite of it, thanks to the social media, I managed to meet with seven persons in Poland – most of them live in Warsaw, there was one boy that I visited in Białystok. There were many volunteers from abroad, I received many kind emails, but due to the student budget I only managed to visit one country. I decided on France and Paris, since that was where the most volunteers were from. I took photos of 6 women, 4 portraits of which were eventually included in the project. The trip to Paris was extensive 4 days during which I spent most of my time in the subway, moving from one side of the city to another with equipment. Filip, my boyfriend, was of great help then; he not only was my reflector holding assistant, but also carried all the equipment without complaint. Besides taking photos for the project, you also had a chance to talk to models about their approach to the disease. Were those talks hard for them? What tricks did you use to make them feel more comfortable in front of the camera? Every session began with a talk – I can’t imagine photographing without it. 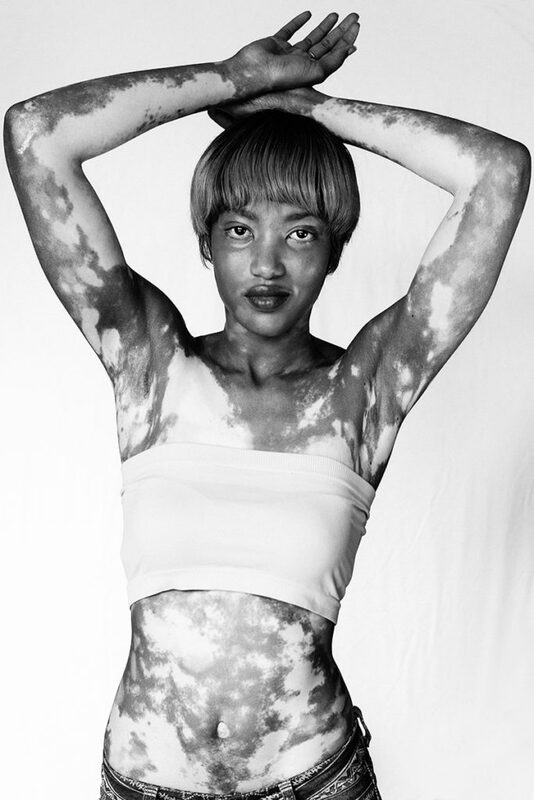 The fact that I had a vitiligo myself made it all easier for me. I think they could feel that I was trying to get to know something from them not only because I needed it for my project, but mainly because I was simply curious. Prior to PATTERNS I didn’t know anyone with vitiligo! Were those talks difficult for them? For some of them they were easy, for some others less so, but every person that I took pictures of had come to terms with their looks long before they met me, even if only to some degree. Otherwise, they wouldn’t have contacted me. The person that I’ll remember the most is Hania, a girl from primary school, whose parents contacted me at the very beginning of my search for people that could participate in the project. They said that their daughter had a progressive vitiligo and had a hard time dealing with it. They asked me to meet with her, talk to her, and show her that “it wasn’t the end of the world.” They weren’t even sure if I would be able to convince Hania to take part in a session. I came to see her a few months later and I met an incredibly intelligent, kind girl that was getting more and more distance on her patches. We had a lot of fun during the photo session. To my exhibition, which took place in July, Hania came wearing shorts, revealing patches. She told me that during a summer camp she explained the children what those white patches on her legs were instead of hiding them and feeling ashamed. I didn’t use any tricks – besides being myself. Just like my “models” revealed themselves to me, I revealed myself to them as well. We have similar experiences, after all. You passed your thesis defense with a grade of A (5.0)! I have heard that you’re going to continue your project. 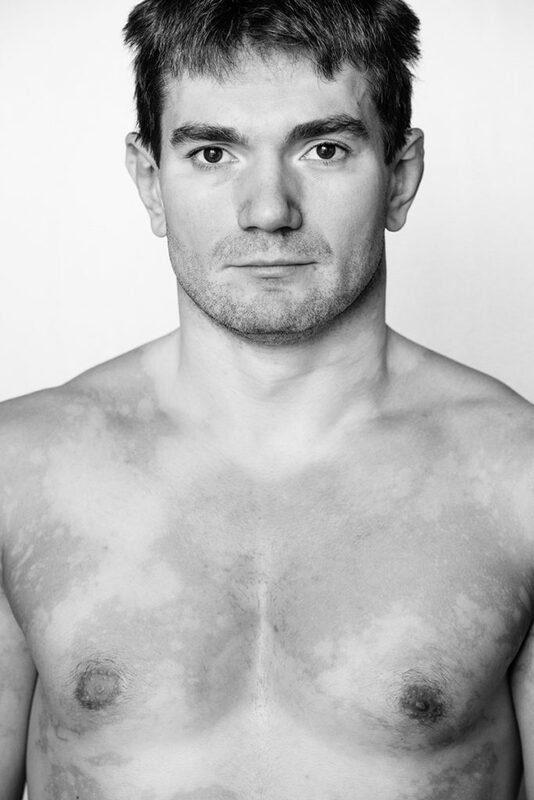 Are you going to add more photos related to vitiligo or maybe you’re thinking about expanding the project? Personally, I’d be happy if you made a mini-reportage that would include not only pictures of people but also their comments about their approach to their bodies and disease. Yeah, it’s true, I don’t think about this project as closed. I still think about those dozens of messages that I got from people asking for a meeting. I want to have a chance to talk to all those people one day, take photos of them, and maybe, at the same time, help some of them. Unfortunately, it is very absorbing and – considering that I want to visit people of different nationalities – it requires considerable financial resources. As for now, I’m consumed with Master’s degree studies and work. But I believe that one day I’ll be able to continue this project! As to your suggestion: I have a notebook with all the talks I had with people that I met. I myself felt somewhat dissatisfied, knowing that the visitors saw only the face of the portrayed people but didn’t had a chance to hear their story, even though they could probably read some things from their looks or statures. I’m going to change it in consecutive editions of the project. When will it happen? I don’t know. I’m wondering, did you have any other ideas for your diploma paper before the Vitiligo Project? I’m currently preparing for my first exhibition, looking through the piles of old magazines like National Geographic and Traveler, but I always come back to the original theme that I developed in my head. What about you? When I started thinking on the topic of my thesis, I was looking for ideas in the area of documentaries and reportages, for people of whom I could tell stories or interesting phenomena. I was digging through the old editions of a French magazine Photo and searching various web portals related to photography for inspiration. Suddenly, in the proverbial shower, I had a brainwave. Why, for the first time in my life, not do a project that at least to some degree would be about me? About experiences that I shared with others? I can’t say that this project has played some self-therapeutic role, because I already had had a rather indifferent approach towards my patches. But something happened – now, when I see the new patches appear or the old change shape, I feel a tiny bit proud. I’m glad I can be a part of this “vitiligo family” of which a year and a half ago, before carrying out this project, I didn’t even know. What advice would you give photographers who only start their journey in this world? Where to look for inspiration? Not everyone can draw it from “themselves”. So where from? I’ve only started my journey in this world myself! I don’t know if I can give any advice, but I’ll try. 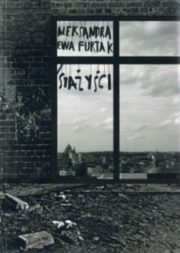 I remember I took away a lot from classes on history of photography with Andrzej Zygmuntowicz. If you see hundreds of photos every week, then you automatically start thinking about them. For those who don’t get to do this – you don’t have to study photography to do photography – the Internet is a boundless source of inspiration. I recommend visiting foreign websites, although there are more and more interesting projects appearing on Polish sites, too. It’s good to follow the top photography contests, check out the winners, think about why they won. Do you like the honored works? If not, then what would you do differently? You can discuss it with friends who are also interested in photography. You should also draw as much as much as possible on events like “Wszyscy Jesteśmy Fotografami”. 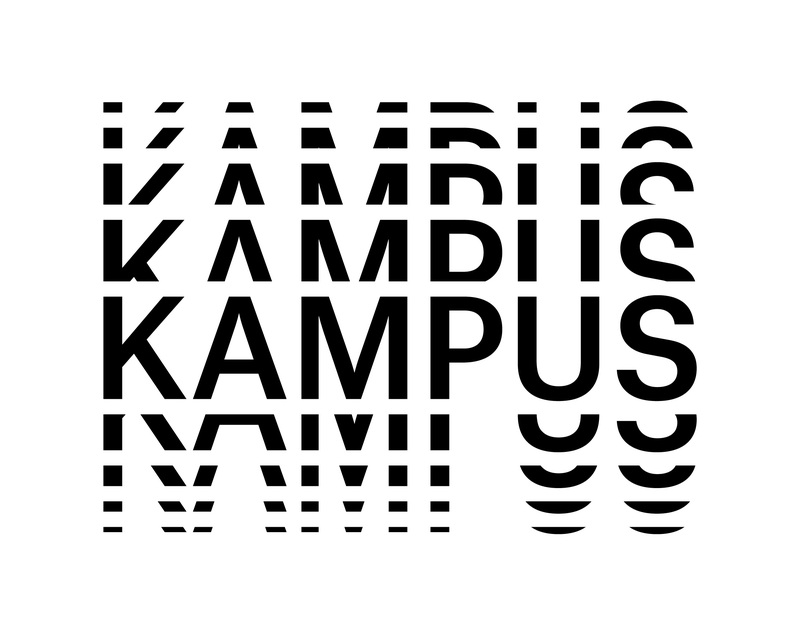 You can visit Fotofestiwal in Łódź… There are plenty of possibilities. It’s just, the more of those things you do, the more often our brain starts to think about photography, see through frames, notice interesting topics. And then (in case of photojournalists and documentalists) while reading a newspaper in the morning or browsing news portals (whatever you like, i usually read “Duży Format” or “Wysokie Obcasy”) you can suddenly get an idea that something is worth turning into a photographic reportage. Lastly, please tell us Julia, when will be able to see your next exhibition? Maybe you have any idea for it? I don’t have any plans for exhibition right now… It’s not that easy. Lately I’ve been trying my hand at photography in a NEBA collective (www.behance.net/nebastudio). Together with Kasia and Filip we’re finishing our first photocast on Wólka Kosowska. There are so many topics that I’d like to take on, but I can’t keep up with all of it. It may be a common saying, but there really aren’t enough hours in the day!